Winter may not technically begin for another couple of weeks, but frigid temperatures and wicked snow are assailing various parts of North America. The weather outside is frightful, but winter birds are so delightful… guess that’s as good a reason as any to brave the cold. Alas, I had no time outdoors this weekend, which leaves House Sparrows sheltering a giant wreath as my Best Bird of the Weekend. Jealous? Corey’s Best Bird of the Weekend was one that many birders across the Northeastern and Midwestern United States probably also selected, a Snowy Owl. This particular one was one of three at Floyd Bennett Field, Brooklyn, on Saturday. Although I saw Dunlin, Black-bellied Plovers, Sanderlings, Harlequin Ducks, and more, my best bird of the weekend was the Anna’s Hummingbird at my feeder. The temperatures got down to 17 degrees, and I now bring the feeder in at night because it freezes solid. So far the hummingbird has survived! No Snowy Owls in Costa Rica but did get in a morning of birding at Lands in Love hotel- fantastic foothill rainforest site off the radar of most visiting birders. Best heard only species was a Lanceolated Monklet, best seen was probably Song Wren. A little late to the party, but better late than never. As Mike predicted, my BBotW was one of the Snowy Owls that’s been sighted at Montrose Point in Chicago; this one was chilling (literally) on the boat slips as snow fell all around it. I wasn’t planning on birding, so I didn’t have binoculars, but found myself unable to resist the lure of the Snowy, and others were generous with their optics. 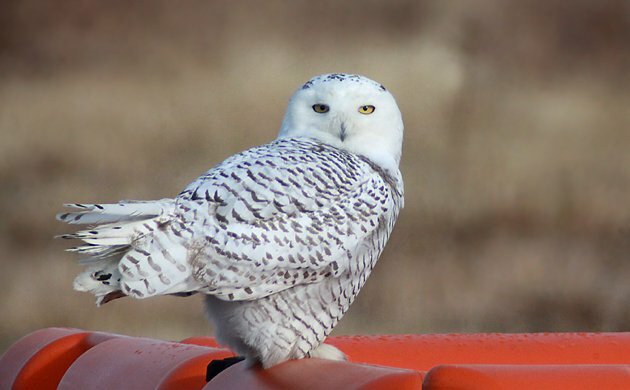 Snowy Owl in snow — it just doesn’t get any better than that! @Wendy: What a hardy little hummer you have there! It’s a great week to bird in Homer, Alaska! Best bird this week, a Rustic Bunting, which is about as rare as hen’s teeth here in Alaska.